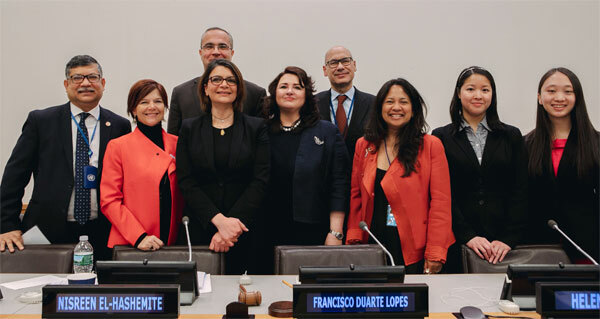 Closing panel of the 4th Forum Celebrating the International Day of Women and Girls in Science in February at the UN. In 2015, leaders of 193 countries, thousands of companies and civil society organizations agreed on the world’s biggest problems and established 17 sustainable development goals (SDGs) to address them in the 2030 Agenda for Sustainable Development. With a vision of 9 billion people living well within the earth’s limits by 2050, upward of $25 trillion dollars will be spent in the next two decades on achieving the SDGs. But, who is best positioned to take advantage of these new opportunities? Who should steward this massive investment? Because women uniquely reinvest their earnings into their families and communities, and tend to design, create and innovate with purpose, we suggest as an “equality moonshot” that females capture at least 30 percent of the wealth and investment associated with achieving the SDGs. In this way, the world resources are owned and controlled by a more balanced and representative group of people who will empower more gender and cognitively diverse teams, which deliver greener and more inclusive economies. How can women business owners access these opportunities? Get smart on the 17 SDGs because more companies are using them to align their strategies or as a framework of engagement. Green, socially responsible products and services, including access to basic services such as water, energy, sanitation and health in developing nations, just got a boost. Determine how your company’s products and services can be aligned with these. For example, companies like Pepsi, Unilever, Ford, Citi and SAP are not only working to improve their environmental and social impacts, but also developing solutions to help others do the same. To achieve gender equality, these companies have also committed to procure from and support women-owned businesses. Don’t fear but instead own the 4th Industrial Revolution (4IR), where digital, physical and virtual worlds are converging. Learn how you can use the 4IR technologies, like artificial intelligence, blockchain or Internet of Things to improve your SDG solutions. Exponential growth that defines 4IR is new to everyone so women can create new business models centered on more purpose-driven products and services. Despite any discomforts with new technologies, women must ensure a human-centered 4IR. And with better access to financing through the #equalitymoonshot, women may be more compelled to study and remain in science, technology, engineering and mathematics (STEM). Act now. The Club of Rome meta-analysis of all the climate and SDGs studies to date finds we only have a dozen years to address greenhouse gas emissions and only one path left to a sustainable future by 2050. It requires five transformational strategies: (1) transition to renewable energy, (2) doubling productivity of sustainable food chains, (3) new development models, (4) reduced inequality gap and (5) quality education and healthcare for all underpinned by gender equality. How do we ensure women have access to these opportunities? As entrepreneurs, align existing or start and grow businesses that help solve big problems using the best and most advanced technologies. As consumers and investors, use our wallets to drive change. Buy from/invest in women-owned companies, or at least from companies supporting women and girls. And boycott those who don’t. Money talks. As business owners, promote other women-owned businesses and ask them to promote yours because studies show that women are held to different standards than men and are penalized for “touting” their own horn. As mothers, change gender norms. Inspire girls to study STEM and pursue wealth-creating opportunities. We need to build a pipeline of future female Bill Gates and Elon Musks. As citizens, make your vote count, run for office or at least amplify the message through social media and campaigns like #SeeHer, #SheHeroes, “If they can see it…they can be it.” Recruit others to demand and pursue our collective #EqualityMoonshot. In many parts of the world, women’s influence in politics is increasing and now we must use our collective powers to also influence businesses and economies to achieve an equality moonshot of females capturing at least 30 percent of the investments and wealth related to the trillions that will be spent in the next two decades in achieving the SDGs. Women should not only align or start businesses that help solve the world’s biggest problems using the latest technologies, but also relentlessly remind corporations and governments committed to achieving the SDGs that they must increase their spending and investments in women and girls and the ecosystem that empowers them. When the world resources are owned and controlled by a balanced, diverse and representative group of peoples, no one will be left behind.